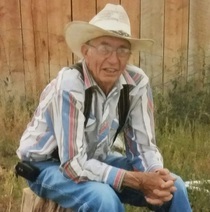 Obituary for Lawayne Fredrick Hurdsman | Crandall Funeral Home Inc.
Lawayne Fredrick Hurdsman, 92, passed away Sunday March 17th, 2019 in Ogden, Utah. He was born to James Fredrick and Daisy Helen Chapple Hurdsman in 1926 in Ogden, Utah. He is a life long resident of Mountain View, Wyoming and graduated from Mountain View High School in 1945 and was a member of the Church of Jesus Christ of Latter-day Saints. On February 8th, 1948 he married Jessie Jacklyn Graham in Evanston, Wyoming. They have 3 sons and 3 daughters. Dad was always busy on the ranch, chasing cows, sheering sheep, hauling milk and working for Bridger Valley Electric. He was an avid pool player at Bridger Valley Senior Center. His favorite hobby was team roping and watching his boys rodeo. He attended many Mountain View sports events being their biggest fan. He was preceded in death by his wife Jessie Jacklyn Graham Hurdsman, both parents, one daughter Tawayna Jean Hurdsman, one great-great grandson Seth Bindl, three sisters-in-law and four brothers-in-law. He is survived by his daughters, Carlene Walker (Mark) of Mountain View, Wyoming, Jalynn Telford (JT) of Spanish Fork, Utah. Sons, Craig Hurdsman (Renita) of Evanston, Wyoming, Boyde Hurdsman (Kathy) of Mountain View, Wyoming and Shane Hurdsman (Rose) of Mountain View, Wyoming. One brother Glen Hurdsman of Mountain View and one Sister Helen Larson (Carl) of Lyman, Wyoming. One sister-in-law Tanya Schell of Valentine, Nebraska. 17 grandkids, 36 great grandkids and 12 great- great grandkids and numerous nieces and nephews. A visitation will be from 6:00-8:00 pm Friday evening at the L.D.S. Stake Center, Urie, Wyoming and Saturday one hour prior to the services. Funeral services will be held in his honor at 2:00 pm, March 23, 2019 at the Stake Center in Urie, Wyoming. Interment will follow at the Fort Bridger cemetery.